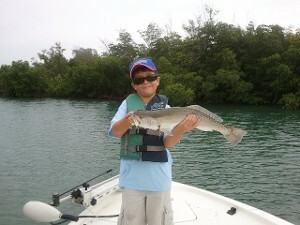 Fish the waters of Ft. Pierce including the Indian River, the Ft. Pierce inlet and the near shore beaches. We will target Snook, Redfish and Speckled Trout. Occasionally we may catch Grouper, snapper, Tarpon, Flounder and Jack Crevalle. What a thrill it is to see a big redfish take your bait and burn the 10-pound test line off your spinning reel. Using light tackle in shallow water, it compares to bone fishing in the Bahamas and Florida Keys. It is quite the rush. 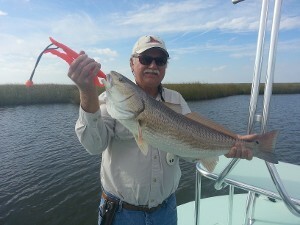 Reds are caught on the flats and under the mangroves on both artificial lures and live bait. Reds are great eating cooked on the grill with whole filet skin and scales side down with your favorite seasoning on top. Very early AM, we will target snook with either live pilchards or artificial baits. Snook is a hard fighting fish that heads for cover the instant it is hooked. 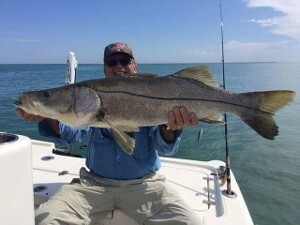 It is a real challenge to keep a snook out of the Mangroves, Docks and Rocks. The snook is a favorite gamefish in Florida for its willingness to hit artificial and live baits. Its' table fare can't be beat. Ft. Pierce has some of the largest "Specs" in the South with a 17lb+ monster record setter caught last year. We catch Specs year round with the largest fish caught April and May. Of course we let these large females go to spawn another year. They hit both artificial and live baits and are great deep fried with some grits and hushpuppies. Launching early am we will see a beautiful sunrise and lots of wildlife. 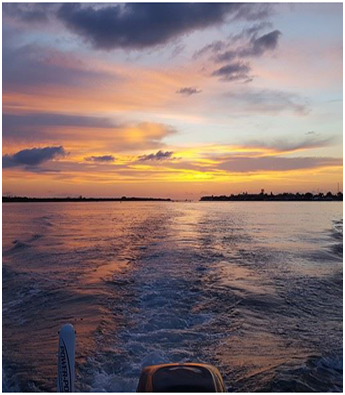 The waters and islands come alive, with another day on the beautiful Indian River Lagoon. Sightings of Manatees and Porpoises are common and all types of water birds will be seen. Captain Charlie likes to get an early start around daylight to find the best spots. We will fish areas that are tide de–pendent for certain species and water levels. Our main targeted fish will be Redfish, Snook and Speckled Trout and don't be surprised if we tangle with some hard fighting Jack Crevalle, Bluefish, Sharks and Goliath Grouper in the deeper waters. The boat ride will be comfortable in my Triton 240LTS bay boat with Mercury 225HP , Minn Kota trolling motor, Power Pole electric anchor Raymarine 12" chartplotter/depthfinder. 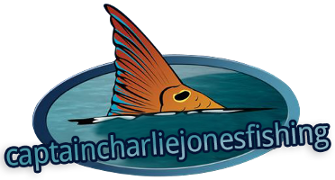 I will supply live bait and artificial lures and appropriate rods and reels. I only use top notch tackle for my clients. Many of the fishing rods you will use are custom built by myself and if you like what you see, you can order one to be built to your specs. 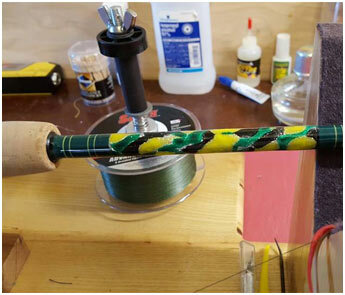 Captain Charlie builds inshore rods with the latest Toray graphite, premium guides and tips, latest marbling or thread wraps in your choice of colors. New style split grips or traditional grips in cork or new style soft grips. Many lengths and actions available.